News today from the New Kentucky Kingdom Park. Screamscape is reporting that cost documents to re-open and re-furbish the current rides has come to light. 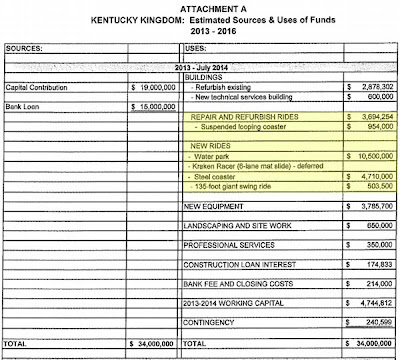 In addition to this, they've also found another document which shows the 2014 'New Ride' cost. It looks like this once abandoned Six Flags Park will finally be getting the love and attention it badly needed. 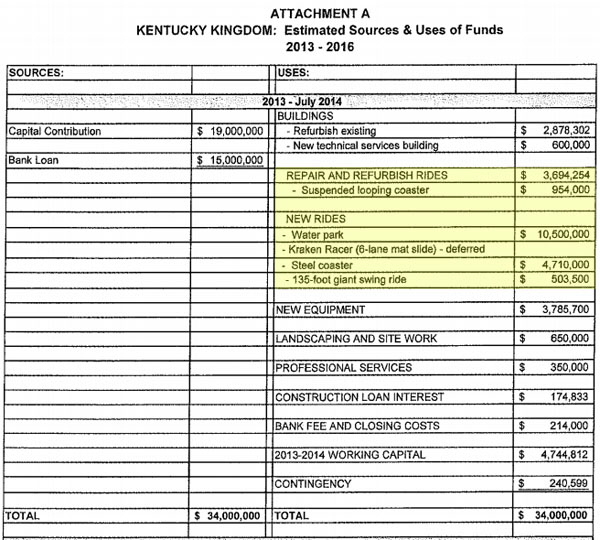 According to the documents, they're spending $3.7 Million of their $43.5 Million dollar budget on 'Ride Repairs and Upgrades'. While this may not seem like a lot, Kentucky Kingdom hasn't been non-operational as long as other previous Six Flags properties (like New Orleans). The Park plans to open in May 2014. Also during this year they'll be spending an additional $10.5 Million on 'New Attractions' as seen below in the price documents. These are reported below as a Giant Swing Ride, A 6 Lane mat slide and a 'Steel Coaster'. You'll also notice they have 2015 and 2016 items listed. A new 'water attraction' and more importantly a new start for the coaster "Twisted Twins". It's nice to see the park putting work in and trying to make it a great place. We wish them all the best and hope to visit next season!